Users on PressbooksEDU networks can enable source comparison on cloned books so that readers can view the difference between the source book and the cloned book. This is a useful tool for researchers, faculty, and others who want to see the modifications that have made to a book across its iterations. This feature was made with open education users in mind. NOTE: The source comparison tool compares the current version of your book to the current version of the original source book. 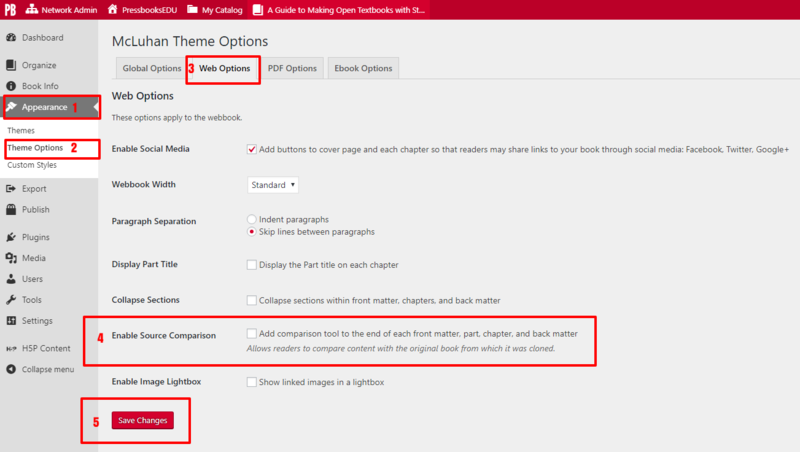 After you’ve enabled source comparison on your cloned book using the instructions above, you can view the comparison tool on any chapter of your webbook. Readers can click the button to view the source comparison. The text displays in HTML form. All elements highlighted in green are additions to the source text. All elements highlighted in red are deletions from the source text. The source comparison will show differences in markup as well as differences in text. For example, if the source book had headings tagged as Heading 1, but the new book had chosen to retag those headings as Heading 2s, this change will be evident in the source comparison. Readers can see the number of additions and deletions, as well as the their location in the text. The comparison content is contained in a scrollable textbox to limit page length. Click the SHOW COMPARISON WITH ORIGINAL button again to minimize the source comparison textbox. For more information on book cloning on your PressbooksEDU network, check out the Book Cloning chapter. Source Comparison for Cloned Books by admin is licensed under a Creative Commons Attribution 4.0 International License, except where otherwise noted.